Because every engine is unique and subject to different levels of stress and operating conditions, Mobil’s line of Delvac Synthetic Gear Oils offers you a comprehensive range of high-performance oils, greases, and specialty products. 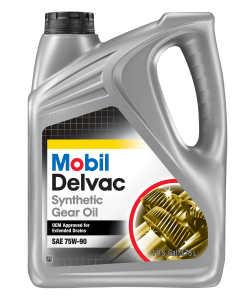 Mobil Delvac Synthetic Gear Oil 75W-140 is a fully synthetic lubricant engineered for use in heavy-duty drivetrains. As a lubricant designed to meet the most demanding extended drain and warranty requirements, Mobil Delvac Synthetic Gear Oil 75W-140 incorporates the latest technology to offer high viscosity and exceptional load-carrying capability where extreme pressures and shock loading are expected. For heavy-duty drivetrains, these designs deliver a higher level of performance, increase productivity, and reduce operating costs while improving the performance capabilities of on and off-highway equipment in terms of load, torque, speed, control, and reliability. The cutting-edge technology in Mobil Delvac Synthetic Gear Oil 75W-140 creates an excellent performance for wide temperature range application, helps to protect against thermal degradation and corrosion, and improves shear stability and fuel economy. To request a quote or place an order of Mobil Delvac Synthetic Gear Oil 75W-140, fill out a form online or give us a call at 800-553-1675.